NEWPORT BEACH — For the past three years, Orange County Coastkeeper has been running an incentive program for boaters with slips in Balboa Yacht Basin, offering to pay for a portion of the cost to switch hull paints from copper-based antifouling coatings to non-biocide paint. So far, one private boater and one city-operated vessel in the 172-slip basin have taken advantage of the program, which is scheduled to run its course at the end of this year — leaving more than $80,000 in unused grant funds still available. “It’s not over yet, and we’re working on getting an extension,” said Ray Heimstra, associate director of OC Coastkeeper. The purpose of the program is to reduce the amount of copper in Newport Bay, which has been listed as an impaired body of water by the state. Leaching copper from hull paints has been determined to be one of the main culprits in copper pollution in the harbor. The program gives boaters the chance to switch over to more-expensive non-biocide paint at a fraction of the cost, with the grant covering 75 percent of the bottom paint application cost up to $4,000. So, for a 30-foot boat, the cost for a non-biocide paint job is about $5,000. Under the incentive program, Coastkeeper will pay $3,600, leaving the boat owner to cover the remaining $1,400. “With the incentives, there’s really not much difference between a non-biocide hull paint and the cost of a copper-based application,” Heimstra said. But while the funds remain available, boaters in Balboa Yacht Basin remain wary of the non-biocide paints, concerned about the paint’s performance compared to copper-based paints, leaving them reluctant to make the change. Copper-based antifouling hull paints have been the industry standard since the 1980s, when tributyltin (TBT) was banned as an antifouling paint ingredient, and are designed to leach copper to prevent algae and barnacle growth on boat bottoms. Copper is further released when abrasive tools are used during hull cleanings, and researchers say the result can lead to copper levels that inhibit marine species growth in harbors. For now, the plan to remove copper from Newport Harbor remains voluntary — but if the amount of copper in the waterway is not reduced to below state standards, the Southern California Regional Water Quality Control Board can issue a Total Maximum Daily Load (TMDL) regulation, which can lead to fines for the city up to $10,000 per day. In San Diego, boaters in Shelter Island Yacht Basin are under a TMDL, requiring the Port of San Diego to lessen the amount of copper released into the water by certain deadlines, or fines will begin. The limit for the amount of suspended copper allowed in the water has been set statewide at 3.1 micrograms per liter, but recent research in San Diego and elsewhere has indicated that the level may be set too low. A report completed in San Diego Bay found that copper levels above the 3.1 microgram threshold were not resulting in any harm to sensitive bay plant and animal species. Heimstra said the state is looking at creating a TMDL for Newport Bay, similar to that in Shelter Island, but no timeline or regulations have been implemented yet. “We still have too much copper in Newport Bay, and we still need to do something about it,” Heimstra said. While the response to the incentive program has been slow, Heimstra did notice an uptick in boater interest when Coastkeeper sent out mailers informing boaters of the program instead of using email announcements. He said he has been in talks with more than 40 boaters this year about switching over to non-biocide paints. 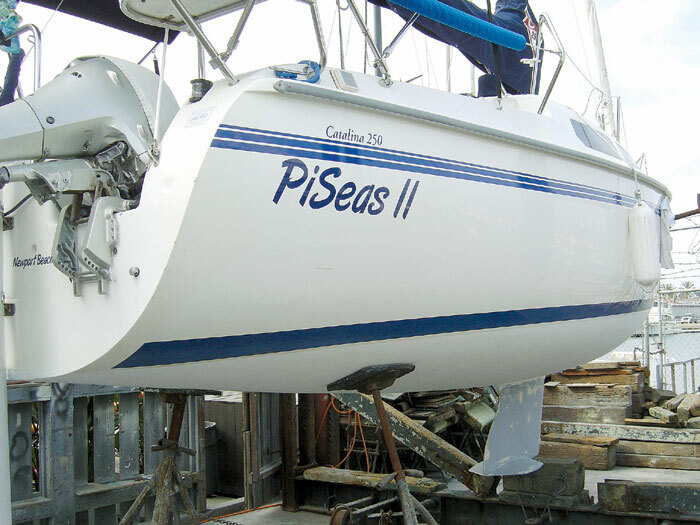 Steve Auerbach, the lone Balboa Yacht Basin boater who has utilized the program, had his bottom paint examined this past June after nearly two years on the boat, and he reported the paint has held up well and looks like new. He hopes to get 8 to 10 years of use before needing to repaint. Likewise, a USEPA-funded report has found that non-biocide paints last longer than copper paints, which gradually become less potent as the copper leaches out. While non-biocide paints are more expensive than copper paint, they require fewer reapplications, saving boat owners money in the long run, proponents said. Besides the economic incentive, Auerbach emphasized the importance of preserving a shared and valuable resource. “I am concerned with the health of sea life. For that reason, I most certainly would recommend (non-biocide) paint to other boat owners. Boaters interested in finding out more about the copper reduction program and bottom paint incentives can email Heimstra at ray@coastkeeper.org.